The elephant we named Ajali was first sighted on the 2nd of November after he had been hit by a car on the Mombasa Highway, most likely during the night as his herd crossed the road to the other side of the National Park. The incident occurred near Tsavo Bridge which is also incidentally an elephant corridor in the new Standard Gauge Railway, and in what must have been a dramatic crossing in which he was hit, he unfortunately lost his herd. We first became aware of his plight when one of the Trust’s Mechanics was driving to our Voi base along the highway and noticed this elephant in distress. He immediately alerted Dr. Poghon who heads the DSWT/KWS Tsavo Mobile Veterinary Unit, who had already received reports and was on his way. Once the team arrived on the scene they estimated his age to be anywhere between six to seven years of age, and he was extremely immobile with fluid dripping from his trunk and mouth. The decision was made to anesthetize him for a closer examination and then load him onto the Trust’s Canter truck to transport him to the stockades in Voi for close observation and supplementary feeding. However, implementing a plan like this took some doing, as lifting and loading a six year old elephant is no easy task. It was soon ascertained that he certainly had some broken ribs and there was the possibility of sinister internal injuries too. The team cleverly enlisted the help of the workers based at Chinese Depo for the SGR Railway and man power loaded the recumbent calf onto the back of the canter for the drive the 60 Kms to the Voi stockades, with Dr. Poghon and some of the DSWT elephant Keepers keeping a close eye on his condition throughout the journey. Only once he was safely laid down in a stockade at our Voi Rehabilitation Unit did Dr Poghon reverse the anaesthetic. His prognosis for recovery due to the breadth of his injuries and further unknown complications internally was guarded at the time. He got to his feet but despite being surrounded by lush, freshly cut greens from the Voi River, lucerne grass and dairy cubes, he did not want to feed. Later however, once the dependent orphans returned home with their keepers for the night, he settled as they surrounded his stockade making their reassuring rumbling sounds and communicating with her all the while. After this he visibly perked up and started to feed, and by morning had flattened the food that was placed in his stockade. This was a most encouraging sign and gave us all renewed hope. Even the next day he fed well, and all the while new and varied browse was placed in his stockade, along with water and soft earth and mud for him to enjoy. But then the following day he was standing still, head hung, fluid still coming from his mouth, with a complete lack of appetite. He was given more anti-inflammatory drugs via pole syringe and again perked up once the pain was lessened. That thankfully was the last day he showed these signs, since then he has fed well, calmed down enormously and is healing well. 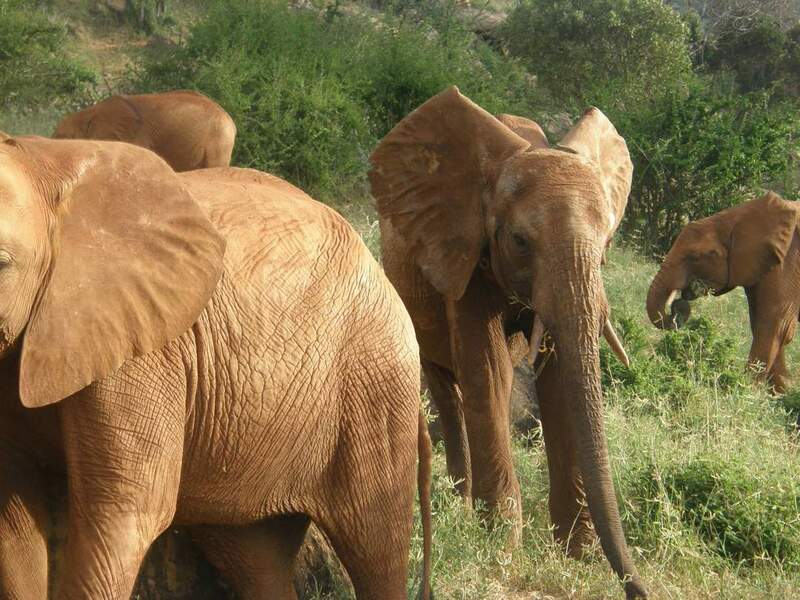 We were confident that with tender loving care we would be able to save Ajali. In January 2017 Ajali was finally well enough to come out of his Taming Stockade and join the orphans out in the bush for their daily routine. He instantly took a shine to Mudanda who he likes to browse with, and he is doing extremely well. Who knows with the mysterious ways of elephants, he may well find his family again on his daily jaunts with the orphans out in the wild, or join up with some of our own orphan bulls to form his own bachelor herd; nevertheless thankfully this is one lucky calf given a second chance at life.